"You sing the blues. You don't have to live them." Darnell Martin's Cadillac Records is a gem, not because it tries to say anything new about the cultural and sociopolitical matters that are almost infuriatingly in tumultuous flux throughout the period of time it chronicles through the lifespan of Leonard Chess's Chicago-based Chess Records, which was so instrumental in bringing about the opening of black R&B music in the 1950s and 1960s to the masses, but because it is, fittingly, an exemplary case of a film achieving a rhythmic power. As the film commences, Chess (Adrien Brody giving his most vulnerable performance since The Pianist) wants the American dream—to have a home, a wife and a Cadillac she can drive. The film finds a strangely compelling rhythm itself. Writer-director Martin creates not a standard-issue “biopic” like Ray or Walk the Line, but a film that celebrates the colossal impact black musicians had on American culture in the twentieth century. Not dissimilar from the way in which Charles Foster Kane's newspaper empire functioned as a barometer for the man's personal well-being, sensibility and, in screenwriter terms, “character arc,” in Citizen Kane, Cadillac Records uses the storyline of black blues being born out of the southern cradle of folk music, to the maturation and transformation into R&B and rock 'n' roll, as a transcendental background that informs the emotional waves—both the waxing and waning—of the multiple characters. This does not sound entirely different, and it is not, but it is, in the hands of Martin and her impressively magnetic actors and actresses, executed almost as well as possible. Playing the legendary Muddy Waters is Jeffrey Wright, whose sotto voce impersonation manages to go to depths not plumbed by the mimicry of Jamie Foxx as Ray Charles or the force-of-will characterization of Joaquin Phoenix as Johnny Cash. (Though both actors were quite good in their respective ways.) Already playing a man whose quietness could be deafening, whose offstage donning of his doo-rag symbolized his intractable personality and sharp individuality, Wright underplays all of the bumps on the road, all of the rich highs and all of the tersely bittering moments in which life seemingly chooses to play a cruel joke for no special reason. As the narrator, songwriter Willie Dixon (Cedric the Entertainer), informs the audience in sadly the only useful bit of narration, Muddy Waters had to be built as a persona (which Dixon says was his primary job), and Muddy grew into becoming that man. Wright's performance is receiving good notices, but its subtlety extinguishes the potential of great acclaim, which is a shame. Wright's performance may be informed strictly by what is known about Muddy Waters, but in any case, his strong, vibrant sense of knowing brings greater, more shaded nuance to the character. Foxx and Phoenix played Charles and Cash almost like leaves blowing in the wind, taken from one place to the next. Muddy has his dalliances with admiring females, buying them jewelry and dinners in exchange for their exuberant lustfulness, but he always knows exactly what he is doing, and why. An important way of seeing this is examining scenes in which Wright, as Muddy, calmly but forthrightly assists his boss, Chess, in sensing when his wife is displeased with him. In Cadillac Records, the leading figure as played to perfection by Wright is not a cypher through which momentous changes occur—he himself is a rueful observer, watching himself as much as he watches others—a point made literal in excellently composed shots of him staring at himself in the mirror. One standout is Columbus Short as Little Walter: the actor brings a charged volatility to the man that explains, but never excuses, his personal behavior. Even when the character's destination is foreseeable—including to those historically unaware of it—Short's emotively expressed sincerity prevails in winning the viewer over, to simply allow the ride to continue unabated. Mos Def is a surprisingly convincing stand-in for Chess Record's first great crossover, Chuck Berry. Def's humorous quipping and charismatic aplomb—even when Berry is being arrested for transporting white minor girls across state lines in Indiana—inject a warmth and detachment all at once. And then there is Beyonce Knowles, whose performance as vocalist Etta James is one of the best supporting turns of the year. Beyonce took the under-written part of Diana Ross—or whomever she was euphemistically called—in Dreamgirls and made a little something out of it, but in Cadillac Records she almost burns up the screen as a wounded, hungry, unaccommodating rising star. It is difficult to circumvent the woman's distracting beauty, which is probably why too many critics have likely avoided, ignored or dismissed her acting. Beyonce plays Etta as a fully formed being—she is considerably different from the others whose paths she crosses, and simultaneously, her pain, which daunts her almost endlessly, speaks to the people she signs for—whether they be the musical peers depending on her vocal talents or the people who will listen to her singing. The film is not perfect—not great, not close to being flawless—and there is no purpose in ascribing points of technical or artistic merit to a movie whose subject matter is admittedly deserving of a superlatively sonorous treatment. Martin indulges in at least some movie-land myth-making, instances of which echo back to “biopics” that came before. In one such moment, after the charming but homicidal Little Walter is told by Les Chess that his mother has died, Little Walter tells Muddy that his true mother is his harmonica, with which he brought a wholly unique sound to Chess Records. Muddy holds out a flask of liquor for comfort. Little Walter is quite reluctant, certain that it will disrupt the aureate beauty of his musical art. Finally, however, Little Walter relents and grabs the flask, promising seconds before nearly emptying the contents into his system, “Just a taste.” And so Little Walter's decline begins in earnest, with that one dramatic decision, in the unbearable crucible that one crucial moment. In Walk the Line, Phoenix's Johnny Cash stormed out into the night, irate at the situation in which he found himself, due to June Carter telling the roguish Cash that any nascent love between them had to be excised before it could begin. It just so happened a fellow musician offered Cash some highly addictive pills at that very moment, when he was at his weakest, James Mangold's film posited. The likelihood of such definitive turning points in life is unlikely; the vast majority of “real life” is a languid blur, and starting points for habitual behavior, including addictions, are rarely so ably located with such accuracy and precision. Much of life is so internally dictated, so removed from the dictates of logic through the falsely comforting prism of quantifiable personal reality, that these films, in their formulaic deconstructing of the famous musical artist—which is, naturally, based on the realities of these artists' careers—are probably telling a story at the expense of verite considerations. But that is what movies do. They tell stories, they simplify complexities and they mold a story out of life's myriad realities. They make sense out of the insensible, forming coherent stories out of a confusedly muddled world. That is what movies do. Judged, therefore, on the sheer emotional thrust of its own worthwhile story, Cadillac Records is a triumph on its own terms. Martin's blending of wildly antithetic characters and the consequent sub-plots that weave throughout is thorough, measuredly following the story of Chess Records. The picture terrifically clamps down on the bitter acrimony in a markedly different kind of workplace that so often characterizes the relationships between people who truly love one another. Martin is still finding herself visually, perhaps, but she has a knack for stitching together potently punctuating dramatic scenes that refuse to go away quietly for fear of embarrassment. This film, too, deals with drug abuse, but the pivotal, highly-charged and emotionally complicated scene that takes on the brunt of the film's time on the indignities of drug abuse is unlike any other in a film remotely like this. Playing out between the strung-out Etta and the sympathizing Chess before a fireplace, the scene establishes a superb contradiction that bedevils the characters: the pit of smothering heartbreak, loss and excruciating memories against the mocking promise of romance. And Martin maintains that high-wire act of emotionality, which is a truly welcome sight. If she cannot reinvent the wheel, she can make it durable, and she does, with great integrity. Not everything works. The narration is in its own way affable and mildly interesting, but there are several times when its pedantic laying out of the literal, particularly in the ambiguously political relating of the racial discord and angst of the era, seems superfluous, like title cards explaining the cultural meaning of numerous scenes' drama for anyone who did not “get it.” However, when Martin and her cast launch off the ground, they soar. And none fly higher than Beyonce, whose performance must be seen and heard; the immediacy she brings to the role of Etta is something truly inspiring to witness. So much of the character's introduction is seeped in time-worn cliché, with her throwing hissy fits and temperamentally demanding things in the studio. Brody's Chess has to threaten to pull the plug before extracting the kind of singing he needs to hear from her. Beyonce succeeds because she grabs the cliché and breaks down its pulverulent coating until what seems like the real Etta emerges through her. Yes, the musical biopic staples are almost all still here, but they hit harder. The best example? Beyonce's singing of “I'd Rather Go Blind.” As in Ray, a pivotal moment is made out of a singer truly singing a song to someone in their immediate proximity. As Beyonce's Etta ferociously sings the song of embittered, crushed and impossible love to the man she loves, and who loves her, the married Chess, the faithfulness to Etta's vocal work is noteworthy. Viewed from Chess's perspective, Etta is as beautiful as ever. Yet while the camera closes in on Etta, her countenance is dented; a defiant sneer develops. As the scene and song both swell in bombast, with the crying Etta belting out her lyrics directly at Chess, Martin courageously keeps the close-up of Beyonce's Etta running, finally breaking the shot for good when Chess walks out of the room just as the song addresses his action (“Then to see you walk away from me...”). And so Martin completes her cinematically rendered essay on race relations in mid-century America through the power of music. History is simplified, and the delicately recounted black-and-white history of Chess and his musicians is made accessible to follow, from his offering of Cadillacs to his most prized finds to a back-alley assault at the hands of blacks he withstands as "South Chicago... was changing," according to the narration. But movies do that. And good movies do that well. Cadillac Records may not be the most rigorous motion picture out now, but it has one attribute missing in at least some of the supposed titans of this Oscar season: soul. I cannot wait to see this one Alex, and as soon as I do I will read your review! Thank you, Nick, I hope you enjoy it whenever you're able to see it, and return to the review! What an eloquent defense of this film. Most critics have been at best lukewarm on it but your very well argued review makes me wanna give it a chance. Thank you kindly, Tim, I hope you--and everyone--gives it a chance. Nice review. I'm glad you liked it, because many of the other critics unfairly gave the film short shrift. I especially liked your discussion of the flask scene. At times, little arrows (or a close up)seemed to point at a drink and say uh oh, but the movie has undeniable merit. Thank you, FilmDr. I've been looking at some reviews since finishing my own and I too am saddened to see so many critics unfairly give this film "short shrift," like you say. This review looks great and I will return to it tomorrow for a comprehensive response. I admit i wasn't as fond of the film as you, but I'll admit that music has always been regarde din th ehighest esteem. This looks really great though! Thank you, Sam, I look forward to your "comprehensive response"! Very eloquent review. I'm one of those readers that doesn't get into reviews when I still need to see the film, and I'd been rather indifferent on Cadillac Records for the last few months so I was curious as to what you had to say. And, well, you changed my mind. I don't know why I hesitated in adding this to my ever-increasing list of to-see '08 releases; this is the sort of movie that I'd usually dig – plus, Mos Def at Chuck Berry? Count me in. Once I've caught it (admittedly it won't be for awhile), I'll be looking forward to comparing notes. I'm sincerely glad to hear you're going to see it, though. I think the phenomenon you are describing occurs to all of us: there is a film out that we are mildly interested in seeing, it receives mixed reviews, nobody in particular seems to be rallying to its defense, and so we let it slip by. And Mos Def has a lot of fun as Chuck Berry. I'll be looking forward to the note-comparing ahead, T.S. Oh this sounds like a great movie. I'm so glad to hear you say you enjoyed it!! I hope you like it whenever you see it, Vanessa. Wow what a spirited review! Beautifully written. Makes me want to see this very soon! Thank you for the very kind words, Maria. I recommend it to you! This has some of the best writing on film I have read in a long time. Exhaustive, thorough and very powerfully written. I saw this and enjoyed it. Maybe you are overselling it a tad but who cares you have written a great piece. Thank you for the tremendously kind words, Moses. 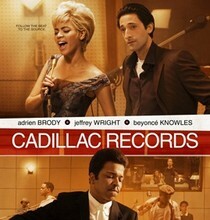 The initial glow of seeing the film has worn off some, but I still believe Cadillac Records has been unduly underrated. Much of it is because of the ascendancy of the "musical biopic" from the past few years, I am sure. This is a bloody brilliant essay! I love how passionately and intellectually you write at the same time. Thank you, Anonymous. I'm happy to see that you enjoyed this piece so much. I really do think this is a terrific essay. Bloody terrific. I love Jeffrey Wright and it was grand to see him in such fine form here. Thank you again, Anonymous. Yes, I'm a fan of Jeffrey Wright (if only they'd let him act in the blasted Bond films) and it was rewarding to see him spread his wings but in a way that seemed quite different from any other actor working today as well. I checked this out because of your positive review and I must say I think you were right on. I loved the performances and while it's not perfect there's a lot to love. Great points about how movies work. Fabulous read and very good movie. Thank you, Harold. I'm glad you sought the film out and enjoyed it. Thanks again for the kind words. Beyonce is also really hot. Exhaustive essay. I just saw this and enjoyed it but it does have some problems. I love how you analyzed it from top to bottom though. Thank you, Anonymous. Fittingly I just saw this again a few evenings ago and it held up rather well, but I agree that it's not a perfect film. It's also a bit more downbeat in all honesty than I considered previously, but I do cherish its relative sincerity wedded to cinematic sleight of hand. Superlative essay. I just saw this last night and thought it was great. I must say, your bit about how movies work is some of the best writing on film I've ever read. Thank you very much, Sean. I'm quite humbled to say the last.